Electromyography (EMG) is a diagnostic test that measures the health and function of the muscles and the nerves which controls these muscles. In electromyography, muscular contractions are caused by the electrical impulses that are transferred to the muscles by the nerves. These electrical impulses or signals are known as action potentials. For example, the action potentials for flexing the arm originate in the brain. These impulses then travel through the nerves which control the arm muscles. The nerves transfer these impulses to the muscles through neurotransmitters, which travel through the neuromuscular junction (NMJ) and bind with receptors in the muscles. These neurotransmitters cause the muscles to initiate a series of responses (mainly influx of calcium into the muscle cells) which cause them to contract. Electromyography is used for certain conditions affecting the muscles or the nerves which innervate them. Electromyography is performed by inserting thin metallic needle electrodes into the muscles being tested. 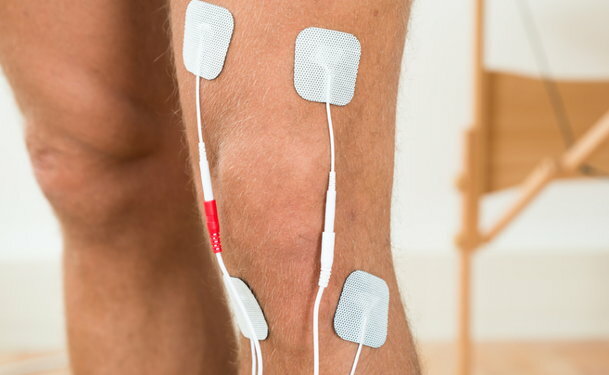 These electrodes are able to measure the electrical activity in the muscles. A few minutes after electrode insertion, the patient is asked to flex or contract the muscle and the electrical activity produced by the contracting muscles is recorded on a monitor. Insertion of the electrodes into the muscles may cause electrical activity. Therefore, a few minutes should elapse before a patient is asked to contract the muscle. Oftentimes, nerve conduction studies (nerve conduction velocity or NCV) are performed alongside an EMG. Electromyography is classified as either as conventional needle electromyography or single-fiber electromyography. In conventional needle EMG, the electrical activity of an entire muscle unit (a muscle plus its nerve supply) is evaluated and is measured in terms of muscle unit action potentials (MUAP). Single-fiber EMG studies the electrical activity in an individual muscle fiber. This is especially useful in myasthenia gravis, a disease which mainly affects the small muscles of the eye and face. Patients who have muscular or nerve diseases, or display symptoms of muscle weakness, may be candidates for electromyography. There are no special preparations required. However, since cold temperature may affect the results, you may be asked to wait in a warm room before the test is performed. Aside from the pain experienced by the patient during electrode insertion, there are no serious complications associated with electromyography. Bleeding, usually minor, and muscle pain or tenderness are the most common side effects of EMG. Infection at the insertion site is possible, but carries only minimal risks. EMG can cause falsely elevated values of creatine kinase (an enzyme present in the muscle) since insertion of the needles damage some muscle cells. As a result, this enzyme is released into the blood and can affect other laboratory tests.